How Has The Family Home Evolved Over The Last 50 Years? Technology, social change and the way we work have drastically changed the British home over the last 50 years. From how long we spend on housework – 44 hours per week in 1965 – to tech that helps us save money every day. Anglian Home Improvements undertook some research into how British homes have evolved in the last 50 years. Read more about the 50 Years survey. 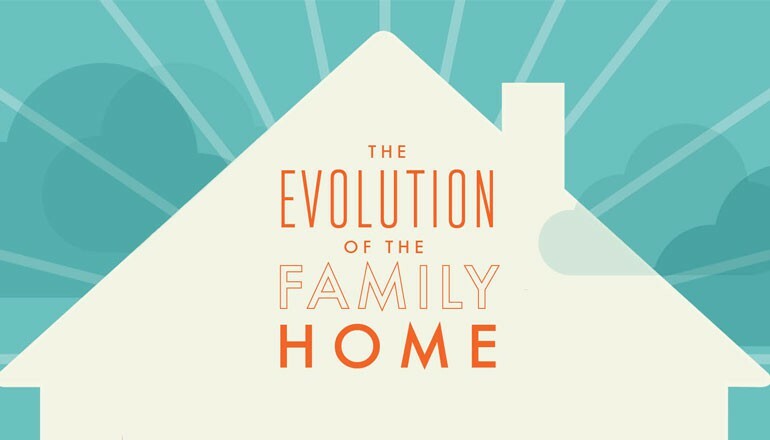 Take a walk through the last five decades of evolution with The Evolution Of The Family Home! Have you kept any old items for nostalgic effect, or are you yet to properly clear out the loft? Do you think we missed any important aspect of home evolution? Let us know in the comments. Our homes have come a long way since the 1960’s, as have women’s roles within it. How have our homes & families evolved in the last 50 years and what do we want in the future of housing? • 25% of people agree the most significant social change over the past 50 years in the way we use our homes is men and women sharing tasks. 57% agreed separate dining room was most loved improvement trends over the last 50 years. • In 1972, 37% of households in UK turned to central heating. • Equal pay act 1970 was fully implemented in 1975. • In 1979 James Dyson patented the bag less cyclonic vacuum cleaner. • Today, a third of women (37.7%) felt they couldn’t do without an automatic washing machine, compared to just over 1 in 5 men (22.6%). • Almost 1 in 3 said the cooking space was the area in the home people most looked to improve on 40 years. • In 1992, the first ultrasonic toothbrush initially known as was given the ‘nod’ by the Food and Drugs Administration (FDA) r to be used in households. • In the 1990s coloured bathroom suites were in fashion, either the avocado green or a blue or pink shade. • All homes built since 1990 are fitted with water meters. 1 in 2 of those surveyed said indoor toilets has made the most positive difference to our homes over the last 50 years with saying running hot water and 41% insulated windows. • In 2011 86% of people owned a mobile phone. • In 2011 all households, 98% had central heating. • People want to be able to use smart phones to control everything in our home. • Today homeowners are most looking to improve their entertaining, cooking and relaxing spaces (26%, 25.3% and 17.3% respectively).